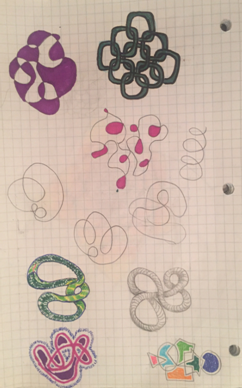 Editor's Note: Diana S. ('17) was interested in math doodles, and decided to explore some two Vi Hart videos, "Spirals, Fibonacci, and Being a Plant," and "Snakes + Graphs." 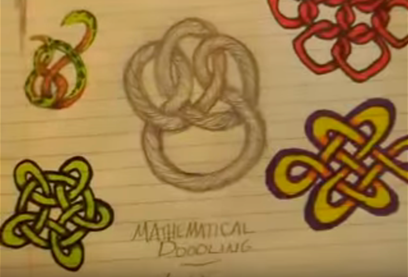 I knew that for one of my Math Explore projects I wanted to focus on videos from the Vi Hart channel because she does a collection of videos titled doodling in math. I really like the idea of doodling in math because math patterns show up everywhere and are really beautiful and intriguing to me. I also like to doodle myself and I am always looking for new ways to expand my doodling horizons. What I liked about this video was that she showed how something so defined and mathematic, like the Fibonacci numbers, are in most plants with spirals. Before this video I remember learning about the golden spiral in geometry but I did not really remember that it was connected to the Fibonacci series. I also liked how this video was very relevant to series, which we learned in the beginning of the year. I learned that the Fibonacci series derives from starting with a square with the side length of one, and then making another square with the same side length above, and then another square to the left by using those two squares as one side forms the Fibonacci series. You continue this pattern counter clockwise, like a spiral, and the series of side lengths would be 1,1,2,3,5,8,15,21… Pine cones and many other plants have spirals that follow this pattern. Vi Hart drew lines on the pinecones to see how many spirals there were and she then went backwards and first drew spirals on paper and then drew a mathematic pine cone out of the spirals. I wanted to see what it would be like to draw a mathematic pine cone, however it was much harder than I thought it would be to get the spirals right. I then watched the second video explaining how some plants grow their leaves at the angle of Φ, which is the number that the Fibonacci series converges to. I found this really interesting because Φ is the only angle that plants can grow where no leaf of petal is directly on top of another. After watching these two videos am left wondering about different types of plants and how they grow based on mathematics. I will definitely be looking at plants more in the future to see if they are based on the Fibonacci series. More of Diana's Vi Hart inspired doodles. The second Vi Hart video I watched was about the different ways that you can doodle a squiggle or snake and what you could do with it. What I liked about this video is that she took one very simple doodle and was able to complicate it. I found it very interesting and sort of mind boggling that if you drew any squiggle and start to draw it weaving by alternating whether the squiggle goes under or over, the weaving will always work out perfectly to make a knot. Another kind of squiggle doodle is when you have a big crossing squiggle and you draw in one shape, you will always be able to draw half of them in and none of the same color will shapes will be next to each other. To me this doodle is more of an optical illusion and I have always been very intrigued by optical illusions. I was inspired by this video to come up with my own doodles and knots and see how it works. In this video she mentioned knot theory, which was something I had never heard about, and when I finished the video I was curious on what that was and whether that explains this squiggle phenomenon. I found a video by Numberphile which explains how the knots that we know of as in tying our shoe, are not the same as mathematical knots. Mathematical knots do not have a start and a finish; they are just one continual knot. A mathematical knot is defined by the least number of crossings that it has. In this video they also explain how mathematicians have still not come up with a way to find the least number of crossings. This is probably why Vi Hart did define the knot theory in her video because there are no explanation for mathematical knots, only different names for them.